For your MSP marketing, you should employ something known as an “opt-in” form. Basically, if a client wants to be eligible for certain products, services, discounts, or coupons, they have to provide information. This usually includes an email address, maybe a snail-mail address, a phone number, or the address of their business. You’re basically pulling them onto your mailing list in a voluntary way. There are a few different techniques to this. But virtually, all of the successful ones involve having something extremely relevant to target clients which is likely to induce them to fill out the form. Opt-in forms have plenty of default templates across the web. But you don’t want to be some common, run-of-the-mill business with a form that can be seen on other sites. For one, older forms quickly become recognizable. For another, this diminishes the individuality that defines your operation; it makes you less unique. When you’re less unique, there is a decreased likelihood of new target prospects converting to your business. You can use offline information gleaning techniques, social media, and online marketing to reach your target market and encourage them to provide you with their information. For example, in terms of offline marketing, if you’re at a trade show or your business’s physical location, you can have a sign-up sheet which includes a slot for an email address. At a convention, you might have a bowl of candy, business cards, and other swag available for potential clients–provided they put their information on the contact form. You can additionally use marketing materials to help encourage the rendering of information. For example, if you know your target market is primarily in education, then you might point out some advantages public schools could gain by using some of your products or services. Also, have a “to learn more” form with a blank spot where prospects can write in their email address. With social media, you want to have articles, videos, pictures, and the like all designed to show potential clients problems, solutions for those problems, and your business as the easing agent in reducing operational difficulties. 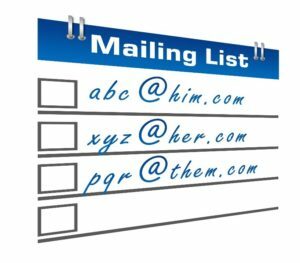 Last but certainly not least, you can use varying online marketing techniques to reach your target markets and harvest their contact information for later emails. PPC (Pay Per Click) campaigns can be useful here. Additionally, you might have a “contact information” gateway in front of a white paper, describing some new technology solution. Working with an online marketing professional can be essential in helping you find the best solution here. Apply MSP marketing techniques, such as online advertisement toward targeted markets, unique opt-in forms, and relevant offers; it will grow your email list.